Very Easy TOEIC Second Edition Get Best TOEIC Preparation Materials and Practice Book for Reading, Writing, Listening, and Speaking. Get TOEIC Materials , Tips, Tricks. Practice more and boost your score. 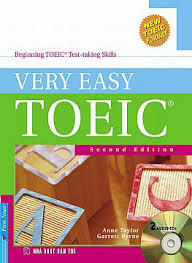 Book Very Easy TOEIC Second Edition is designed for beginners to start learning English TOEIC . TOEIC exam preparation materials includes 12 lessons , a sample test and support , including dictation tape and answers to the exercises . Each book includes an exercise in vocabulary , grammar tutorial part clear and specific , grammar exercises , and a small test (Mini Test ) . A. Listen : By listening practice with the simple , you will learn the vocabulary common to the TOEIC test . B. Reading : The comparison between exercises help you distinguish easily confused word pairs . Small test : This section gives you a test with questions such forms in real TOEIC test . With this test , you can review not only about learning grammar , but also be familiar with the topic will be in the form of the TOEIC test .